Seems like Ben Bernanke has tried to get the final word before the next FOMC meeting, as sort of ex officio member. In a blog post he strongly defends negative interest rates and rails against raising the inflation target as if people were proposing 10% inflation targets. It seems no more than 2% inflation or we are all doomed. He does mention NGDP targeting but misunderstands it badly. His post is so full of errors that it has hard to know where to start. What does “excess global saving” mean? In macroeconomics “saving” is part of an identity equal to “investment”. Like MV=PY. Saving can’t be in excess it has to equal investment. Being generous, perhaps he means there is too much demand to hold money? In which case, central banks should supply more to bring demand and supply into balance; or threaten to do so until demand increases and more is spent. This is a very basic error. It is a view that sees interest rates as the primary tool, rather than a symptom of monetary policy. Interest rates react to nominal growth expectations and these are driven by central banks supplying more or less high-powered money. Interest rates are low in the US because nominal growth expectations are low. Yet US Base Money has been shrinking at between 3-6% for over a year now. Doesn’t he know this? Err, just no, that is not what it is. NGDP targeting asks for a stable growth of NGDP. It particularly targets expectations of growth as expectations drive action – just like in the theory of targeting inflation expectations. Targeting expectations also avoids near term noise in actual data, just like with inflation targeting. More generally, it provides nominal stability, thus preventing the occurrence of major demand shocks, especially those that flow from monetary policy reacting to supply shocks (like the one Bernanke himself presided over in 2008). NGDP targeting does not target “higher inflation”. It is agnostic about inflation. Market Monetarists are often very sceptical that inflation can be accurately measured. And, they are certainly sceptical a central bank can target inflation. It is a sprite and it makes (Real) GDP equally hard to calculate, in real time or even forecast. People live and work in the nominal world, not the Real world. The rest of the article is all about the pros and cons of negative interest rates (many pros) versus a higher inflation target (many cons). The extended discussion on real rates leaves me cold. I don’t really understand what inflation is so I struggle to understand the meaning of a real interest rate and find it very hard to comprehend the neutral real rate. I also know the public finds negative rates almost incomprehensible and regard such a policy as a total failure by “the authorities”, whoever they are. Bernanke’s strong support for negative rates shows just how out of touch he must be with real people. He claims Europeans and Japanese under these negative interest regimes are coping well. That is just not true. He even suggests that negative rates are only temporary, and that everyone knows it, not realising that this renders them toothless, as it promises tightening around the corner. It is hard to know what “higher inflation” he is talking about. 3%, 4%? The golden eras of the US economy usually had higher inflation than today. The lowflation, or rather low nominal growth, of the Great Stagnation he helped create is the thing making economic planning more difficult and impeding the functioning of markets. Economies need healthy nominal growth to be flexible enough in rewards to allow all to see growth in returns, some faster than others. 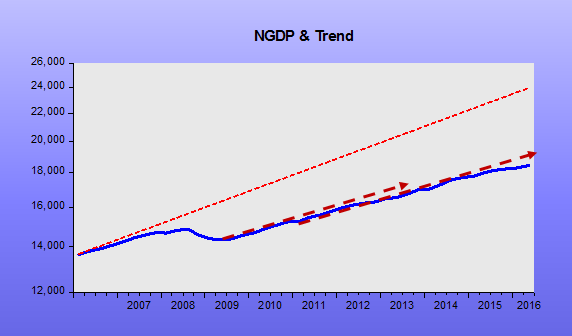 At a crushing 3% or less nominal growth, at a depressed NGDP level (see chart below), this cannot happen. Downwardly sticky wages are a massive problem causing recessions, but also constraining productivity growth in a low nominal growth environment. Yet Bernanke calls for more work! What have the thousands of central bank-employed PhDs been doing all these years? Twiddling their thumbs. Is Bernanke talking his own book and/or that of his employers? Financial stability risks are worst in deflationary environments, no question, just look at the Great Recession or the Great Depression. Tax and accounting issues arise only when inflation is well above 10% or more, and then they are still quite theoretical rather than real. Bernanke seems to be fearing a return to the worst years of the 1970s. He can’t be serious. And then he worries about his various new employers seeing capital losses from betting wrong on financial markets. Well, does he think they should be guaranteed winnings? The article goes on and on with the familiar litany of worries about higher inflation hurting savers, needing political approval etc. etc. No one is proposing 10% inflation. Just 3 or 4%, or better still a commitment to a level target, an average target, and not constant undershooting. Or, better, a nominal income/NGDP level target. He seems to be randomly firing at straw men. He even clutches at the idea of more fiscal activism, as if that could work without threatening the inflation target. He well knows the Fed would offset it at the first opportunity. He never used to be quite this bad, as Scott Sumner tirelessly points out when Market Monetarists get fed up with these manias of the modern Bernanke. Perhaps he’s worried about his lowflation legacy crumbling. It couldn’t happen soon enough for us. He seems to have become a caricature of things he may have ridiculed in the past: an interest rate junkie and an inflation-targeting nutter. This entry was tagged Inflation Mutter, Inflation Targeting, Interest Rate Junkie, James Alexander, Negative Rates. Bookmark the permalink. For 95 years, the Fed paid 0.000% interest on reserves. Bernanke was the first to pay IOR – less than a month after Lehman collapsed! And now he’s talking about negative rates? I’m fine with negative rates as a tool but it is beyond bizarre for the man who couldn’t even leave IOR at 0.000% to be talking about them. Then he talks about safe asset shortages while the safest asset (cash) is shrinking? I feel like I’m living in a Kafka novel. Maybe even Kafka would find it bizarre! I have a question. Could the SNB literally print up a 100 or 500 (or whatever amount) franc note and GIVE one to each Swiss citizen? That is, not use the new notes in normal central bank open market ops to buy an asset that might later be sold to extract those notes from circulation. My thought is that literally giving away money for free has to be a viable way to create nominal growth (and thus inflation as most people think of it). It would probably be a very powerful instrument, so it might be as simple as giving every Swiss citizen 20 francs and making an announcement that they’d keep giving that out monthly, with gradual increases, until they hit some NGDPLT. (note, this is a “physical/mechanical” question. Ignore any potential legal or political constraints for now) As an aside, I think the central bankers way underestimate the power of IOR because they are thinking in terms of Fed funds rate moves from the past, say from 4% to 4.25%. But our current IOR is a dam holding back over $2 trillion in reserves. What I find bizarre in the extreme is that Bernake worries about high inflation punishing savers. What in hell does he think Zirp does? I hate to say it, but I think he’s captured by the financial institutions. A bank can earn 50 bps overnight depositing reserves at the Fed. But you and I need to lock up our money for 6 months to get that on a T-bill. Bill. They could certainly do that. But as with all helicopter money-type ideas, or fiscal stimulus ideas, the rock of the inflation target will block the route. It is a brick wall that cannot be smashed through. These central banks are all happy with <=2% projected inflation, except maybe the Bank of England. That said, they can see the damage that consistently undershooting may cause but can't think of knocking down or shifting that wall. The people have to do it themselves via public pressure or via politicians who "get it". Like that other wall Pres Reagan once ordered to be tore down. I think you’re right that we probably have to push Congress to push changes at the Fed. Congress could for instance clarify its “max employment, stable prices” mandate to mean more precisely “5% NGDPLT”. However I disagree about how strong that wall is. The markets correctly perceive (a) that the Fed is now viewing its 2% inflation target as more like a ceiling and (b) that the Fed owns enough securities to extract all the currency in circulation back out which makes that ceiling very credible. So while I’d much rather see the Fed take the baby step of changing its 2% “inflation target” to a 2% level target, I’d also contend that (b) above is some very important mortar in that brick wall. The easiest way to imagine it is that $100,000 per US citizen is over $30 trillion. If we all got a Fedex package next week with $100,000 in it and the Fed had no securities to sell to ever extract that cash back out of the economy, it’s pretty hard for me to believe that our price level wouldn’t change. There are certain concrete steps that are simply so big that expectations would have to be overwhelmed. Of course, this is all just thought experiments. A Fed that couldn’t even fight the urge to raise IOR from 25bps to 50bps while inflation was still below its target isn’t going to even send out $1 in this fashion. Your thought experiment probably would work, $100k is a lot of money. I fear that even then it might just be a one-off adjustment, Say it doubled the money supply, prices would double o/n and that would be that. No trend growth re-established. If they promised to do it on a regular basis I do fear hyperinflation. If they promised to do it until 3% inflation then why not just say 3% inflation in the first place? Thanks. I had a similar thought – that you might just get a one time adjustment. Or worse than that could be a complete unhinging. For now, I will keep writing the Fed to promote a level target. Heck, all we really need from them right now is “In light of undershooting our target for the last 8 years, we will not tighten in any way until inflation either hits 3% or has been above 2% for 24 straight months.” It seems like the least they could do in this “struggle” (to use Neel Kashkari’s word).